As the most beautiful thing in your front yard and backyard, the flower bed deserves to take the center stage. Therefore, you are not supposed to neglect the essential role of a flower bed borderin accentuatingit. Check out these 25 inspiring flower bed borders that are made out of something that you might never think about. When it comes to bring the elegant and classic look to your front yard, wrought-iron flower bed borders will be the one you can rely on. The curvy edges with distinctive patterns suit any classic houses like French country and Victorian decors. It would be better if you choose the one that has the same shape as your fence so they would flow into one being. This backyard landscaping conjures up the memory when you spent your holiday on a beach with your beloved family. Instead of paved pathway, you can only see white sand that escorts you to the back door. To create an epic border that separates the flower bed and the white sand, several rocks are arranged in a line-up formation. These rocks look like the ones that you can find on a beach. Therefore, the combination of white sand and rocks can combat the mundane look of your backyard. A modern house tends to keep things simple yet amazing, including the front yard landscaping and flower bed borders. You cannot find any sophisticated border that separates the lawn and the flower bed here. All you can see is a bold line that distinguishes the lawn from the white gravel stones. Some white stones line up to create a wavy line that distinguishes the brown from the white gravel stones, making it a stunning flower bed border. If you are looking for flower bed borders that can color up your tedious front yard, you can try this one. 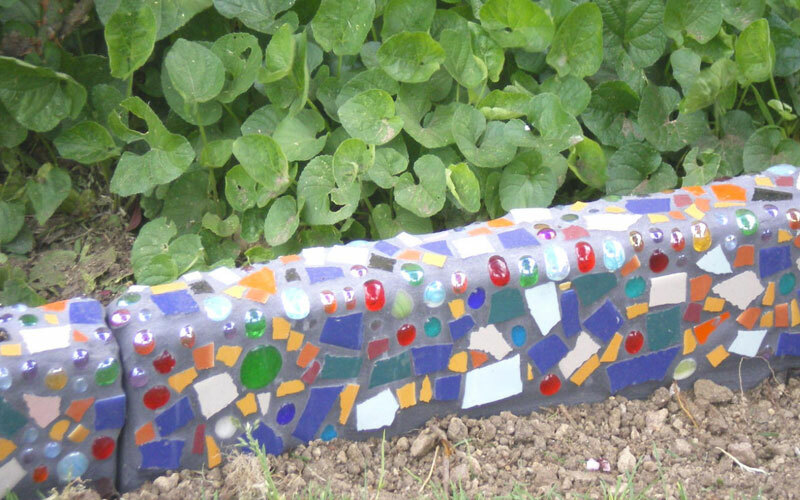 This mosaic garden edge can add colors to your flower bed. It would be better if you apply this border to frame greenery so the colorful pieces incorporated in these blocks can show off their glam well. You can also apply this edge to frame colorful flowers. However, the beads in the blocks would look subtler. These borders made out of plants? Why not? Creating a fabulous border for your flower bed can be done by planting another species of flower or shrub with different color, just like this one. The yellow Viburnums are framed with Dianthus whose purple hues contrast with them. Although they are different in colors, they are bound together with the natural beauty which makes them look beautiful in diversity. Yellow bamboos are usually used for any decorative purposes in Japanese and Chinese houses. Their natural color can add warmth to the exterior. No wonder many Japanese restaurants use these bamboos as an adornment. Now you can do the same thing to your front yard. Get some yellow bamboos, cut them in half, and arrange them along your flower bed or pathway to highlight it beautifully. The best flower bed borders are the one that can satisfy those who are seeking for viewing pleasure in an affordable price. If you are tight in a budget, you need to come up with a smart no-cost idea, just like this border. You do not have to spend any money because you only need to make a run to your kitchen and get some plates. They will give your flower bed a lively lift despite being cheap. There is no strict rule of making a bed borders for your yard. You can make a border out of anything you want, including some leftover. Well, you do not want to leave it unused, do you? This flower bed borders is actually made of shingle sidings. But they look like a bunch of bamboos, right? The sidings are installed face-to-face so they can have hollows that lend a dramatic look to the garden as well as adding a little bit of wooden accent. When you come across these spare parts in your storage room or flea market, you might be wondering what these rinky-dink wastes can do. Apparently, they can do many things beyond your imagination. One of which is making pretty good flower bed borders. These distressed wheels provide the uniqueness of rustic look which will improve the appearance of your garden. You can stack the wheels as many as you can since they will not block the beautiful view. You can still see your flowers through the wheels. Working with underused things like unused bottles that you can find in your house always gives an unrelenting pleasure because now you know how to recycle the waste as well as saving more bucks at the same time. Who would have guessed that these bottles can frame your flower bed perfectly? You only need to place them upside down and press them a bit so the soil can hold them quite firmly. You might also need to add one or two wire to keep them in place. These wheels will provide a futuristic look to your garden. Unlike the distressed ones that you saw earlier, the silver finish of these wheels will make your house look modern. Making a border out of these wheels is just a piece of cake. Just collect some wheels which are still in a good shape, dig the soil to make a gap where you can put these wheels, and arrange them well. This border style would work best with taller plants as they will just act as an accessory that does not overlap the plants. Wooden logs have always made a great embellishment for both the exterior and interior. No matter how they are arranged – either vertically or horizontally – they will always give you the charm of the rustic look. This flower bed borders, for example, is made of some whitewashed logs arranged vertically to frame the colorful shrubs. The arrangement of the logs creates a raised flower bed that can steal anyone’s focus. Are you looking for sporty borders that can give a personality boost to your front yard? Give this idea a shot! Again, you are going to repurpose underused stuff. However, this one will be a bit harder to get because not everyone can get these old bowling balls easily. But nothing is impossible, right? Using bowling balls as the edge of your plants is unique. Just put them around the plants or the mailbox to impress passersby. If you do not have enough space for your edible plants, don’t fret! You can always apply raised bed gardening which has been widely used by many gardeners who have to deal with limited space. Cinder blocks are one of the most favorite materials used to make flower bed borders. They even provide two extra spaces in each block that allow you to grow flowers. To make the border more appealing, you can invest in some colorful tiles and install them on the blocks. Woven willows are extremely versatile. You can use them to make fences, epic archway, decorative items for your garden, and even making borders. Woven willow edgings always lend the touch of rustic look in your garden. And their beautiful designs have made them a good border as well as embellishment. You will also need to harness your creativity to make this border look more fabulous. If your front yard is not surrounded with fence, consider installing fence around your flowers. Not only will it highlight the flower bed which can draw eyes to it but also prevent it from being trampled. These wood planks add a nuance to the flower bed and mailbox. Just cut the planks in half and install them on your lawn. To accentuate the well-worn look, you can either stain them using liquid stain or whitewash them. Related articles : 19 BEST Beautiful Small Garden Ideas to Apply in Your Home! There are many things in your house especially your kitchen that you can use to make a border for your flower bed, just like these bowls. Look around your kitchen! Do you have some bowls with the same colors? If you do, grab them and cut them in half to frame your flower bed. But you can still opt for another effortless and inexpensive solution – the broken bowls. Instead of throwing the pieces in the dustbin, you can arrange those broken bowls to make a flower bed borders. It does not matter if the are different in colors as they would provide beauty in diversity. Timbers are one of the most ubiquitous materials used to for raised flower beds. You can also use them for your flower bed. But instead of making a border only, you had better make a bench where you can sit down and involve in a chat over the beautiful flowers in your backyard. This garden edging idea is great. The timbers are arranged horizontally to make a raised bed. But you can tweak it a bit by topping the border with wider boards or timbers so you can have benches and flower bed borders without compromising the valuable space. The natural beige color of this concrete border sits perfectly around the beautiful shrubs. It frames the plants without overlapping them. In fact, it supplements them, improving its gorgeous look. Although concrete borders are a bit costly, they are worth buying as they are such durable materials. The best way to get the best flower bed borders without costing you a fortune is by making it yourself. You might find a lot of DIY ideas on the internet and magazines. And, here is one of them. This wooden flower bed borders is impressive with the wavy design. It is made of some bended wood joined with some joints that can be swiveled. Using stone to frame your raised flower bed is a common thing. But you can make one in a new way. And the good thing is that it is DIY-friendly, inexpensive, and stunning. You only need to install some timbers or logs to form posts, connect each post with wires, and finally put some stones between the posts. Why do you have to spend a lot of money and time to make a flower bed borders? This border idea is the best solution for those who are tight in budget and time. From this idea, you can learn that petty things like flower pots can make a splendid flower border when arranged fastidiously. It will really save your time and money. Stone is your go-to flower bed borders if you do not have much time to make a spectacular flower bed borders. The easy installation with the artistic look makes it one of the most favorite borders among gardeners. You simply arrange the stones in a line to form a border. It is easy, isn’t it? Gabion is usually used in civil engineering, road building, and military applications. But this time, you will use gabion to frame your raised flower bed. The most interesting thing of this gabion is it is not filled with stones or sand. You will use a lot of leftover like sidings, metals, and many things that you can find around your house. Those are 24 flower bed borders you can make out of the things you can find at home or around the neighborhood. They surprisingly turn out well despite the bizarre materials.